Common Sense and Service Management: Do you REALLY listen? We're all good at listening, aren't we? After all we listen to things all the time. We listen for entertainment, we listen for information, we listen in order to learn...but how well do we listen to people who are seeking our guidance, or just wanting to unload. Somedays a job in service management can be closely related to working as a counsellor! People come to you with their problems, and you must learn not to underestimate the consequences that IT glitches and errors can have on someone's mental health! In the 1990s I was very involved in an organisation called Parent to Parent, this is a service that matches children with disabilities, medical conditions or other special needs to a parent of a child with a similar issue affecting their life. As a parent of two children with rare immune deficiency syndromes I undertook training in active listening techniques to help me support other parents who found themselves facing similar struggles. Active listening involves techniques that allow you to really listen to what you are being told, without prejudging your response, all the while emanating empathy and encouraging the person who is speaking to impart all the necessary information to help you respond appropriately. When I started working in service management, the feedback was that I was very good at placating difficult customers and sending them away happy. I firmly believe that what I did differently was to actively listen to the concerns that were being reported. 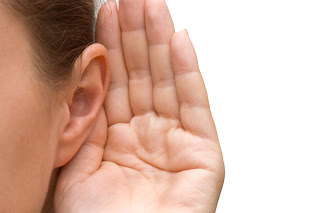 So today I am going to try to impart some key skills of active listening, if you can incorporate these techniques into your customer interactions then you will, undoubtedly, improve the satisfaction that your customers feel when dealing with you. Research has shown that we actually only remember between 25% and 50% of what we hear, actively listening can dramatically improve that statistic. The main reason that we don't remember what is said to us is that we spend some of the time formulating what we are going to say in response, usually prejudging what the other person is saying, often incorrectly. We also let our minds wander...did you remember to put the cat out before you left home? You take in the surroundings....I wonder where they bought that vase, that would look great in my lounge! Once the other person has finished speaking you have taken in less than half of the information they have imparted...that is a pretty dismal result, but it can be easily improved and you will be amazed at the difference it makes to your customer relationships. Use paraphrasing to reflect back what you have heard - "What I am hearing is....", "So what you are saying is....."
Ask questions periodically - "What do you mean when you say....."
Don't interrupt the speaker, allow the speaker to finish each point before you ask questions and don't interrupt them with counter arguments, no matter how much you want to tell them that they are wrong! Respond appropriately, being candid, open and honest. You can assert your opinions openly, but at the same time treat the speaker how you would want to be treated yourself...with respect. Active listening is all about respect, you are there to gain perspective and understanding and you gain nothing by being argumentative, attacking the speaker or putting them down. Something I have noticed is that people in IT, in general, are masters of the passive aggressive comment - Well if that's what YOU think, then I guess we will have to do it! - PLEASE stop it! Being an active listener is a lot harder than it sounds, and chances are that you will have a lot of habits that you will need to break. I still find myself composing my questions while another person is speaking, and I know that when I do that I do not listen effectively. Start being very deliberate with your listening, when you are having a conversation, whatever it is for, dedicate yourself to really hearing and understanding what is being said. Put aside all other thoughts and behaviours and concentrate on the message that is being imparted. Doing this will not only improve your effectiveness in your role in service management, it can dramatically improve any relationship you have...try it!